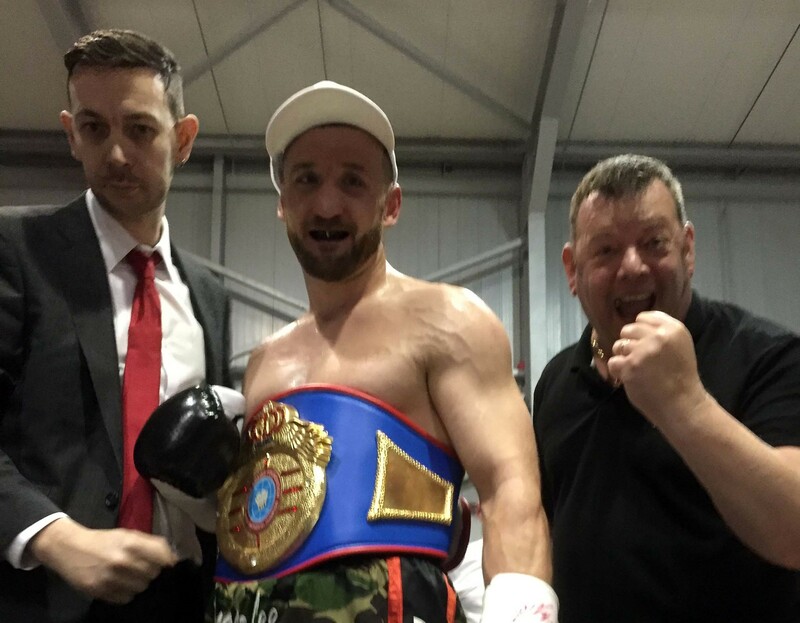 Newport’s Lee Churcher scored a sensational ninth round stoppage over Barrie Jones, of Ferndale, to win the vacant Welsh middleweight title – in front of his home supporters at Newport Leisure Centre, South Wales. The finish came at the beginning of the ninth when Churcher crashed home a powerful right hand that had Jones touching down, Jones bravely got up but then took a knee again – beating the count but was, rightly, judged to be in no fit state to continue. The bout was closely fought and I had Jones ahead at the time of the stoppage by one round. Churcher had started the bout quickly and tried to overpower Jones from the first bell, but the bout soon settled into a pattern of Jones picking his shots and using good lateral movement with Churcher less busy and stalking his opponent around the ring. Jones was the busier fighter but the edge in power seemed to be with Churcher though the ninth round stoppage came out of the blue. A few times, in the fight, Churcher would start fast and land powerful hooks – the first and fourth rounds in particular. The Newport man showed a determination and will to keep going and never seemed put off by Jones educated combinations and jab. The win was greatly received by the home crowd who loudly supported their man through-out the bout. Churcher improves to 10-3-1 while Jones falls to 19-10. Lightweight Lance Sheehan, of Aberdare won a four round decision over tough Lithuania, Simas Vlosinas. You don’t always know what to expect from Eastern European Imports but the shorter, powerfully built Vlosinas came to win and was looking to catch Sheehan with counters. Sheehan fought a smart, tactical fight and used an effective jab and superior movement/ hand speed to win all the rounds and really finished the bout strongly. I sensed that if the fight had been over a longer distance then we would have seen a stoppage. Vlosinas was game but a little crude and Sheehan’s accurate shots drew blood from the nose. The Aberdare man officially won all four rounds and I saw it the same. Sheehan has all the tools to really progress in the sport. Sheehan stays unbeaten at 5-0 while Vlosinas drops to 2-4. In a super middleweight contest, Cardiffian, Lewis Patterson looked very good in his first professional bout against Joe Jones, of Llandeilo in their super middleweight bout. In the opener, it didn’t take too long for Patterson to find his range and show his speed, power and accuracy which were all impressive. Flashy, at times and even looking sideways before throwing sharp combinations – Patterson dropped Jones with a left hook at the end of the round. Jones got up but retired on his stool due to a left hand injury. He was outgunned and outclassed and to be honest – I couldn’t have seen him getting back into the fight. Patterson is now 1-0 while Jones drops to 0-6. Justyn Hugh, of Newport kept his unbeaten record with a good performance against Steffan Hughes, of Pentrefoelas. Hughes was brave but often beaten to the punch and did ship a lot of punishment – until he retired on his stool at the end of the third. Hugh, a powerfully built, muscled fighter really pummelled his opponent through the rounds and it’s a credit to Steffan Hughes that he stayed in there for as long as he did. Hugh’s record improves to 10-0-1 while Hughes drops to 3-7. The show was promoted by Inner Core Promotions (Steve ‘Sammy’ Sims and Kevin Maddox) and was an enjoyable evening of entertaining boxing.